At 7:00 PM, the members returned to Salon A for the Evening Session, Producer Showcase - Bedded Pack, the Complete Scoop. Mark Russell, Swallowdale Farm, Orwell, VT gave his presentation, Bedded Pack - Challenges and Benefits. Below is a picture of the barn housing the bedded pack. Note a clean alleyway between the pack and the feeding stanchions. A major challenge is to design and build housing that is big enough to house the dairy herd and have sidewalls that can take the pressure of the bedded pack as it builds up overwinter against them. 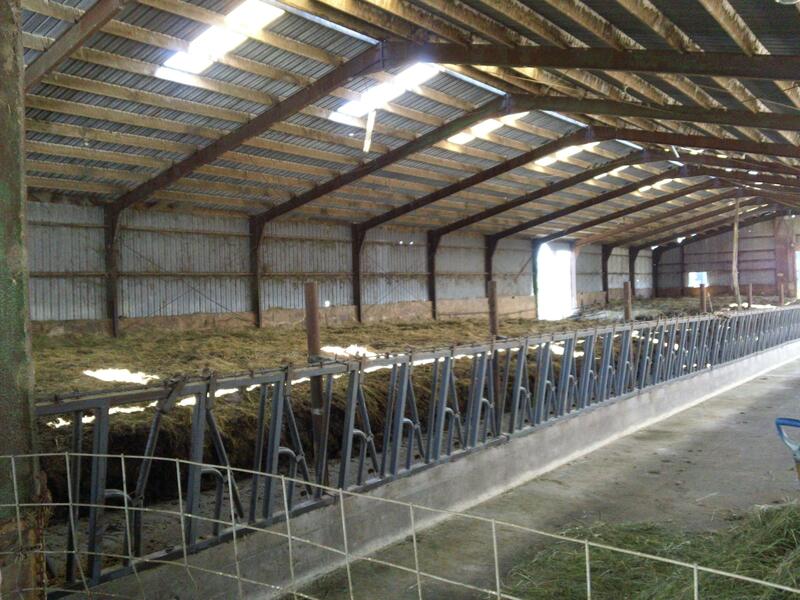 The fa-cility is a major investment, but if designed right, it can lead to these benefits: cow comfort during the winter season, strong sidewalls to keep the building wall from kicking out, and provide a good feeding area when it is too muddy or deep in snow outside. Note skylights to provide some daytime heating. The other challenge is to harvest enough bedding material. The bedded pack area is 6000 square feet. The hay stack above is 260 large round bales of reed canarygrass. Two bales of hay are used daily. This has to be covered to keep the bedding material dry so it can soak up urine and dung moisture, be comfortable for cows to lie on, and not be frozen or partially rotted making it difficult to place down. Mark uses a \$2400 bale spinner to unroll hay bales. A bale processor would cost significantly more, from \$10,000 to \$20,000. 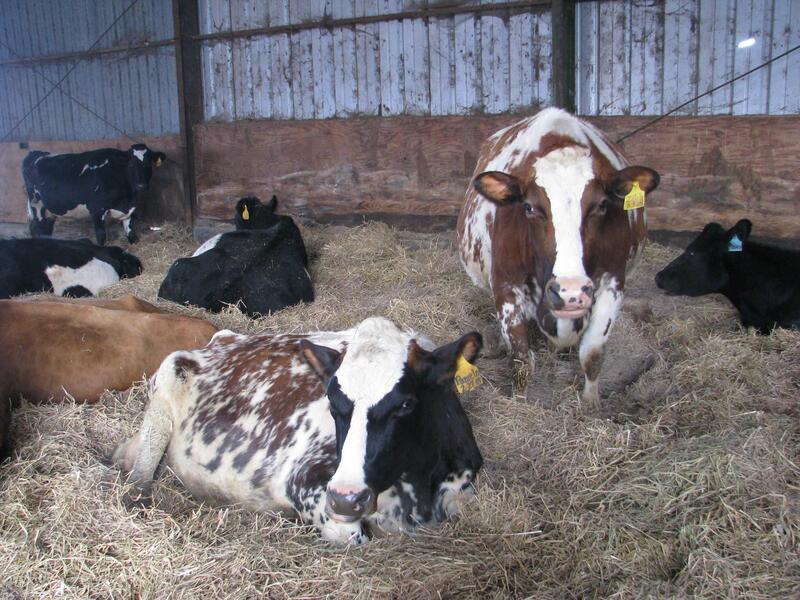 Note the comfortable cows below on fresh bedding. When spring arrives, the barn is cleaned out with a backhoe, and the manure trucked out to a field in a dump truck. It is placed in a long pile to be composted. Then, it is spread after composting with a manure spreader. 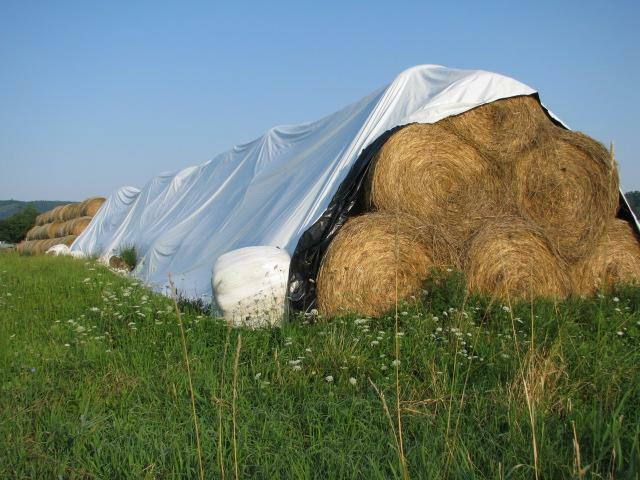 The composting stabilizes the nitrogen in the bedding and the manure can be spread in dry weather during the growing season. It beats daily hauling during the winter when it is inclement and nutrients, organics, and bacteria can be lost to leaching or runoff during thaws. If weather conditions are bad enough, daily hauling from a traditional stanchion barn or free-stall setup might be delayed several days creating unsanitary conditions at those facilities.